David Bagwell, our minister joined us in September 2013. He was brought up in Plymouth and then attended Bath University, training to be a middle school teacher. Having been called into the Methodist Ministry he studied at Wesley College, Bristol before taking up his first appointment in Southampton. He did further training for an MA in Evangelism Studies at Cliff College and has served in Bracknell, Nailsea (near Bristol), and most recently as superintendent minister in Camborne in Cornwall. 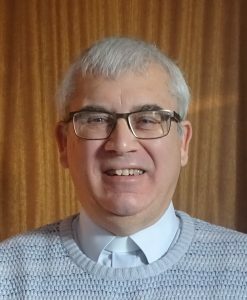 David has been involved in the setting up of a number of new churches, and other ecumenical initiatives such as Street Pastors and Food Banks, over the years. He has combined his desire to effectively communicate the good news of Jesus with his love of the open air, in writing a number of books based on long distance walks, and a series of small group study guides on Christian discipleship and Celtic Spirituality. David is married to Ann and they have two married children and five grandchildren. They both have a love of gardening and have transformed many a manse garden. In his spare time David enjoys playing golf. Ann has trained and worked as a counsellor and has been an administrator in the health service and elsewhere. Contact David by telephone: 01277 623085.